Find out if your doctor is in the BCBSTX Bluechoice PPO Network by contacting member services at 888.762.2190 or access the provider finder feature at www.bcbstx.com and select Blue Choice PPO. is selected from several offered possibilities. Employees receiving $600 or above in cash rewards during the year are subject to taxation, per IRS guidelines, and will receive a Form 1099-Misc from Vitals. Questions? Call the number on the back of your member ID card. A voluntary Health Savings Account (HSA) from HSA Bank will be offered for those on the High Deducible Health Plan. With Smart90, you have two ways to get up to a 90-day supply of your long-term maintenance medication at your local Walgreens. You can conveniently fill those prescriptions either through home delivery from the Express Scripts Pharmacy or at a Walgreens near you. What are some benefits to Voluntary Smart 90? Our medical plans include Benefits Value Advisor (BVA). You have a choice when deciding where to go for care. BVA can help you choose cost-effective doctors and facilities for procedures such as: MRIs, child birth, knee surgery, endoscopies, etc. How a Benefits Value Advisor help me? For additional information call BVA at 888.521.2227. Our medical plans include MDLIVE Virtual Visits. MDLIVE provides you and your covered dependents 24/7/365 access to board-certified physicians for non-emergency medical care through the convenience of phone or video consults. Cost for an MDLIVE Virtual vist is $10.00 if you are enrolled in a PPO plan, or $44.00 if you are enrolled in the HDHP plan. or by phone at 888.726.3171, download the MDLIVE APP from the APP store. Blue Distinction Centers have demonstrated expertise in delivering clinically proven specialty health care. The goal is to help you find excellent care, while encouraging health care professionals to improve the overall quality and delivery of care. How can you find a Blue Distinction Center? Speak with a BCBS Customer Advocate at 877.768.2005 for assistance in selecting a Blue Distinction Center. Preventive eye examinations are covered at 100% with no co-pay through CARES medical insurance, using a network provider. A Flexible Spending Account (FSA) allows you to budget and save for qualified medical expenses incurred over the course of your plan year. Dollars invested in an FSA are tax-free, and the entire election amount is available on the first day of the plan year. That makes an FSA a great tool for saving money, especially when big expenses are anticipated. A Dependent Care Account (DCA) covers expenses such as work related daycare and elderly care costs. You may only receive reimbursement from your account equal to the amount you actually deposited. For the 2019 plan year (January 1, 2019-December 31, 2019) the maximum election for the flexible spending account is $2,700. Mutual of Omaha is the carrier for college provided life insurance, as well as individual optional life insurance. 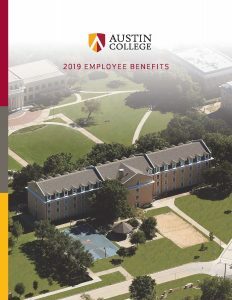 Austin College provides life insurance and accidental death and dismemberment insurance to all benefit eligible employees (effective on the first day of the month following date of hire). Coverage under this college-provided policy is 1.5 times annual earnings, not to exceed $50,000. Optional dependent life insurance in the amount of $10,000 for a spouse and $5,000 for a dependent child is available under this group policy. Employees are responsible for the $1.50 per month premium for spouse and/or dependent life insurance coverage. Additional employee or spouse life insurance is available, subject to medical review. Life’s not always easy. Sometimes a personal or professional issue can get in the way of maintaining a healthy, productive life. Mutual of Omaha Employee Assistance Program (EAP) can be the answer for you and your family. Don’t delay if you need help. Visit mutualofomaha.com/eap or call 800.316.2796 for confidential consultation and resource services. Austin College provides disability insurance through Mutual of Omaha for all benefit eligible employees (effective on the first day of the month following date of hire). In the event a disability determination is made, benefits are 60% of monthly earnings up to a maximum of $8,000 per month. In the event of disability, this disability payment will be considered taxable unless you make a special election to pay tax on the premium that Austin College pays on your behalf. (Complete the form at the bottom of this page). Open Enrollment is the only opportunity for Austin College benefit-eligible employees to make changes to benefit elections for the coming year, unless a Special Enrollment occurs. NOTE: Premiums are paid in advance.